By the March 2011 deadline, The Bahamas had met all the Organisation for Economic Cooperation and Development’s (OECD) compliance stipulations, with the signing of the requisite amount of tax information exchange agreements (TIEAs). In April, the jurisdiction also proved competent in the first round of Peer Reviews. In response to the dynamic global economic environment, the government amended the National Investment Policy in this month, raising the minimum dollar requirement for foreign direct investment (FDI) in a commercial undertaking and removing the restriction prohibiting international investment in restaurants and/or entertainment facilities. The headline stealer for the month, however, was the sale of controlling shares in the Bahamas Telecommunications Co to Cable & Wireless Communications Plc (CWC). The global telecommunications company completed the acquisition of the national company for $210 million during an official signing in Nassau. Bolstering airlift to the island nation, US carrier JetBlue announced in May that it will add another flight to its services to The Bahamas, flying three times a day between Fort Lauderdale and Nassau. 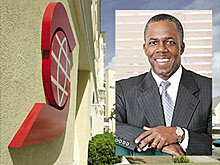 Scotiabank’s managing director in The Bahamas, Barry Malcolm, left his post during this month, after a three-year tenure. In his last interview in office, the banker talked to The Bahamas Investor of his achievements at Scotia and his ventures for the future. The month ended well for the jurisdiction, with the international credit rating agency Standard & Poor’s (S&P) maintaining The Bahamas’ credit rating of BBB+, with the same stable outlook. Credit analyst Olga Kalinina said that major fiscal issues were being addressed, and the tourism and other investment projects provided good prospects for maintaining a stable outlook. Two months after its acquisition by a foreign company, BTC announced plans to improve services and cut costs, investing $43 million in 4G mobile network services. 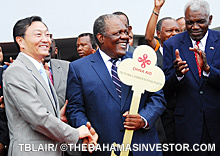 Other foreign influences were to be felt during the month, with The People’s Republic of China officially handing over the new, ultra-modern $30-million Thomas A Robinson National Stadium to the Bahamian people on June 22–a gift hailed by Prime Minister Hubert Ingraham as a symbol of good bilateral relations. June also saw one of the key events in the financial services industry calendar, with delegates from all segments of the sector attending the Nassau Conference. The event’s agenda included addresses on topics as wide ranging as doing business in Latin America, financial opportunities in the maritime industry and the practicalities of using SMART Funds within trusts and corporate structures. 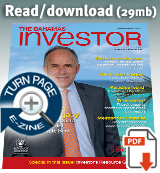 In an exclusive interview in The Bahamas Investor January-July 2012 issue, Viana Gardiner, acting director of investments at BIA, says she expects the upward trend in foreign direct investment to continue through 2012.